Virtual reality gaming PC setups generally require full-sized bulking desktop cases, but what if you’d get the same performance out of something smaller? 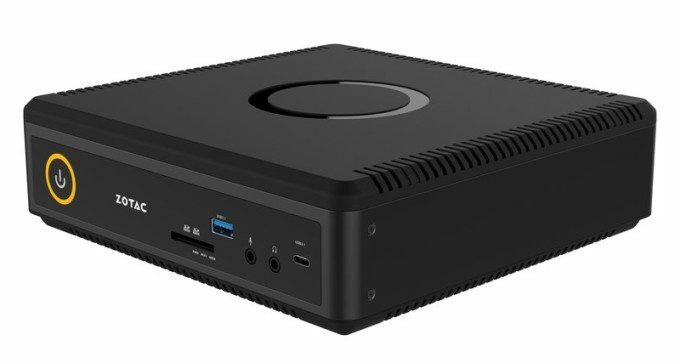 At CES, gaming and PC hardware manufacturer Zotac showcased several new compact PCs including the compact and VR-ready ZBOX MAGNUS EN1070K. The EN1070K is part of Zotac’s gaming line of ultra-compact PCs, but do not let its miniscule footprint fool you. It offers the Intel Kaby Lake Core i5 processor, an NVIDIA GeForce GTX 1070 GPU and accommodate up to 32GB of RAM. That is more than enough processing power to run a VR setup such as the Oculus Rift. In terms of performance, the GTX 1070 is a notable anchor for EN1070K. As one of the newer models in the NVIDIA card family, the GeForce is a slight step behind the higher-end GTX 1080, but it can handle current-generation games and VR titles at demanding graphics settings. Connectivity-wise, the mini PC also crams a full bench of options into its case. Available slots include 4 standard USB ports, one USB 3.1 Type-C port, one USB 3.1 Type-A slot, an SD slot, two DisplayPort slots, two HDMI ports, two Ethernet ports and a standard headphone jack. Notably, the MAGNUS EN1070K fits all this into a compact case that sports dimensions of only 8.3x8x2.5 inches. There’s no word yet on when the EN1070K will be released, or for how much. Given the last generation E-series cost around $1,499, you can pretty safely bet the new one will retail for roughly the same, depending on specific components you elect for. So even though it’s small enough to fit into a VR backpack, the MAGNUS EN1070K’s price tag may be too big to fit into your budget.